record the receipt of documents. An email as such is basically unstructured: it is "hand typed" thus spelling errors can easily be made in such things as the subject, or the project title. This makes it very difficult for the person recording the receipt of the email automatically. These references are somehow passed to the other party in a manner which enables them to record them and or re-use them without any copying or re-keying. have an attached form in HTML format to allow the response to be made in the event that the recipient does not have their own formal system. 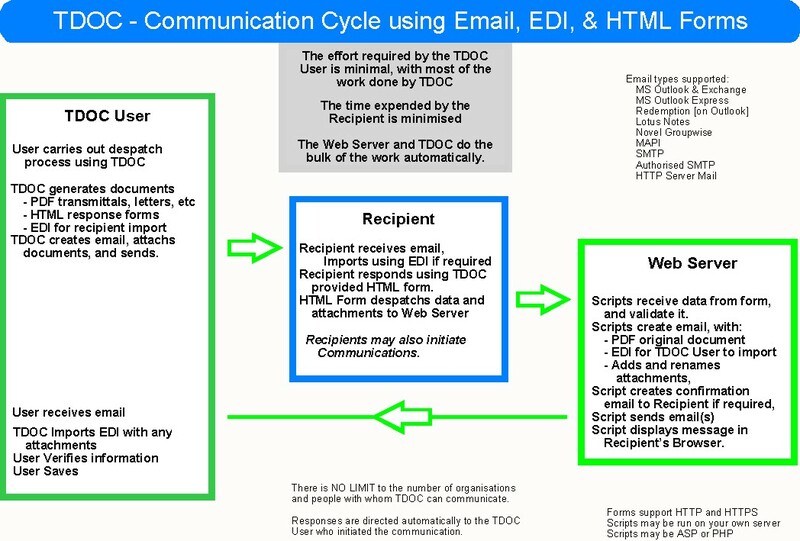 the web server generates an EDI and emails this back to the originator with any attached documents. The solution might be termed "EDI and HTML forms with server side processing". Click to see a diagram showing the Solution used by TDOC which works in this manner. Please note that a "blank" HTML form can be issued to someone to allow them to initiate a communication using this technology.